Anyone heading north via the Co Louth townland of Carrickcarnan will cross the border with Northern Ireland three times as it zigzags, snakes and dances with local roads. The road signs change from kilometres to miles and back again. Your phone hums with notifications from mobile service providers telling you to enjoy your stay in the UK. On the motorway, the change is almost unnoticeable. The bottom of the slip road towards Carrickcarnan is in the Republic. The top is in Northern Ireland. The Border region is littered with similar crossing points. They are used every day by farmers tending to livestock and crops, students and workers commuting to college or work, or by visitors who are unaware how different this part of two separate countries used to look. Each of these 300 crossing points has its own story. Some were economic trade barriers before the Troubles ever broke out but many are linked with the violence caused by objections to the Border routes being patrolled and manned during those dark times. "All of those roads were closed off," said Declan Fearon, chairman of Border Communities Against Brexit (BCAB), as he stood on the old Dublin Road outside Carrickcarnan yesterday. "There were only 17 official crossing points but hundreds of unofficial crossings. "They became dead ends, overgrown with grass in the middle and filled with trees. The place became a wasteland but we opened them up again." Yesterday it was different. The road out of Carrickcarnan towards Newry was blocked by a new imitation border. An imposing wall was built to block people travelling along a route that was once the main artery between Dublin and Belfast. At one end was a watchtower with a man dressed as a soldier. He was armed with a rifle and wore full military camouflage - his face daubed in green, brown and black paint to hide his appearance. Brexit, specifically a hard Brexit, threatens how people will interact with the Border in future. "You are only a mile from the Border in every direction at this exact spot," said Fearon as he stood on the ''Northern'' side of the wall yesterday. His group said they were determined to have their voices heard on the issue. Its protest yesterday garnered much interest as a crowd of about 500 stood and watched others take to a stage on the side of the road, explaining how their lives would be hit by the introduction of a hard border. 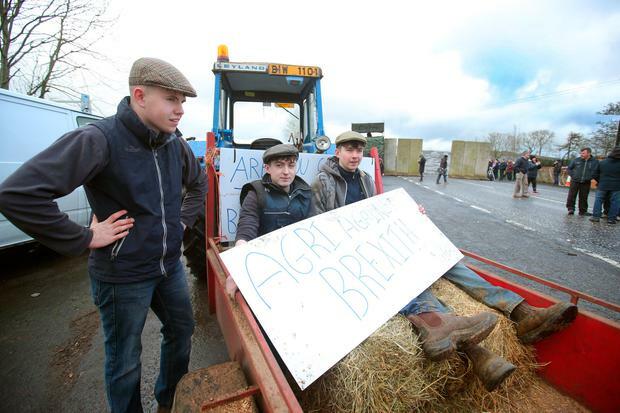 "As soon as I heard there was going to be a [Brexit] referendum, I knew it would become a case of us and them," said John Sheridan, a farmer from Co Fermanagh. Donegal pharmacist Tom Murray said the border would also hit his business. "Taoiseach Leo Varadkar said last week that it is realistic that we will see a border and army personnel in our communities. We will be the ones suffering because of mistakes in Westminster and we will not accept it," he said. The event was attended by public representatives across the political divide and as it ended, those in attendance were asked to come forward and take swipes at the imposing wall. A farmer went first, followed by a student before some of the local representatives got involved. The stunt showed a hard border will not be erected without being met by local resistance. "We protested it before and then the police came in to stop that," said Mr Fearon. "Then the soldiers came to protect the police and helicopters were used to protect the soldiers. All of a sudden, we had a massive, huge military structure. These roads were closed as an economic border long before the Troubles started and that is what will happen to our much bigger European border now."